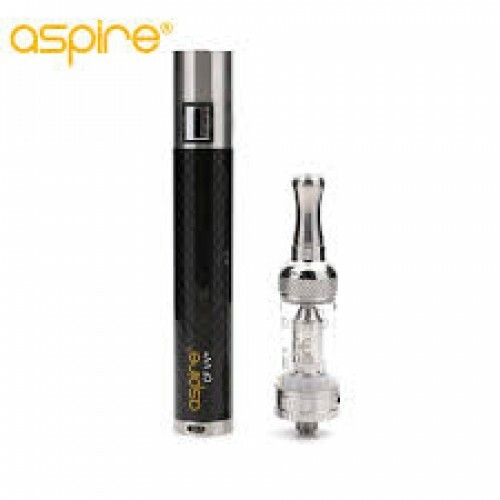 The Aspire Premium kit is made of an Aspire CF VV+ battery and a Nautilus Mini Tank. Nautilus Mini: The Nautilus Mini is the next generation of tank systems. Made of stainless steel and Pyrex glass, the Nautilus Mini uses the Aspire “BVC” (Bottom Vertical Coil) atomizer technology. CF VV+: The Aspire CF VV+ is high-end vaping power system. This battery features stainless steel endpoints, a metal button, and a carbon fiber coated tube. The Aspire CF VV+ battery contains a revolutionary spring connector. This unique technology ensures that there will always be a strong connection between the battery and e-cigarette tank. The Aspire Premium kit is made of an Aspire CF VV+ battery and a Nautilus Mini Tank. Nautilus Mini: The Nautilus Mini is the next generation of tank systems. Made of stainless steel and Pyrex glass, the Nautilus Mini uses the Aspire “BVC” (Bottom Vertical Coil) atomizer technology. This new technology is designed to last longer while still giving users the purest and cleanest taste from e-liquids. The Nautilus Mini Tank includes an improved four-port adjustable airflow system that is both user friendly and reliable. This unique four-port system allows the user to adjust the draw, warmth of vapor, and amount of vapor produced. The Nautilus Mini design also makes it easy to carry, install, and refill. CF VV+: The Aspire CF VV+ is high-end vaping power system. This battery features stainless steel endpoints, a metal button, and a carbon fiber coated tube. The Aspire CF VV+ battery contains a revolutionary spring connector. This unique technology ensures that there will always be a strong connection between the battery and e-cigarette tank. The structural design and control circuit of this battery series makes using it extremely reliable and stable. The CF VV+ battery realizes stepless variation in 3.3V-4.8V output variable voltage. Rotate the rotary knob at the bottom of the battery to deliver the optimal voltage for vaping needs. Replacement coils available to buy here. Replacement plugs available to buy here. Replacement compatible USB charging leads available to buy here.